It is rightly said and I believe it too – wild animals make their appearance or create a natural history when you least expect it. This was one such day at Kabini, (Nagarahole) during monsoons (June 2016). 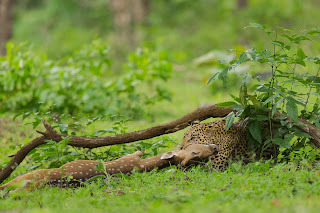 I personally believe that monsoons are the best time to visit forests simply for its soothing greenery and as a wildlife photographer one can make amazing images with lovely colors. However the flip side of this is the animal viewing can also be very low due to thick vegetation. It was just about 8am and suddenly dark clouds were seen covering the sky, a storm was surely on its way. In the meantime the leopard decided to move and took cover inside the bushes. 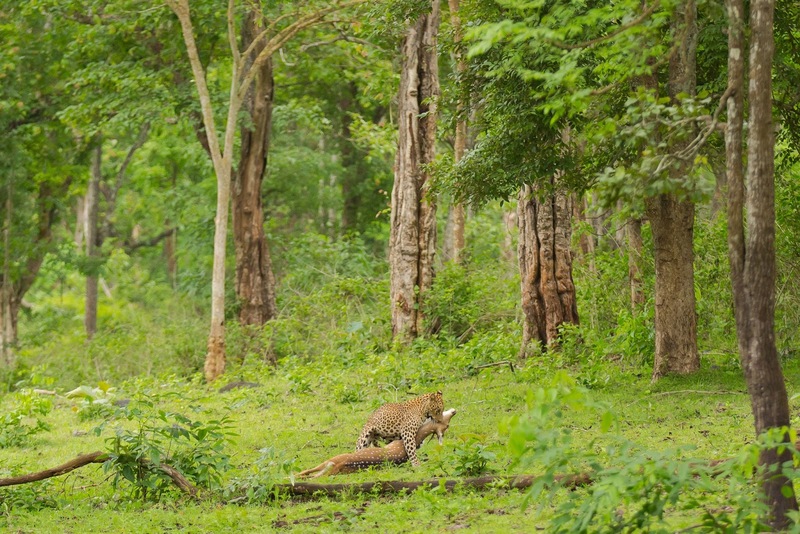 He had noticed that a large group of spotted deers (Chital) approaching in his direction. I looked at the deers they were over 50mts away, and completely unaware of the leopard’s presence. 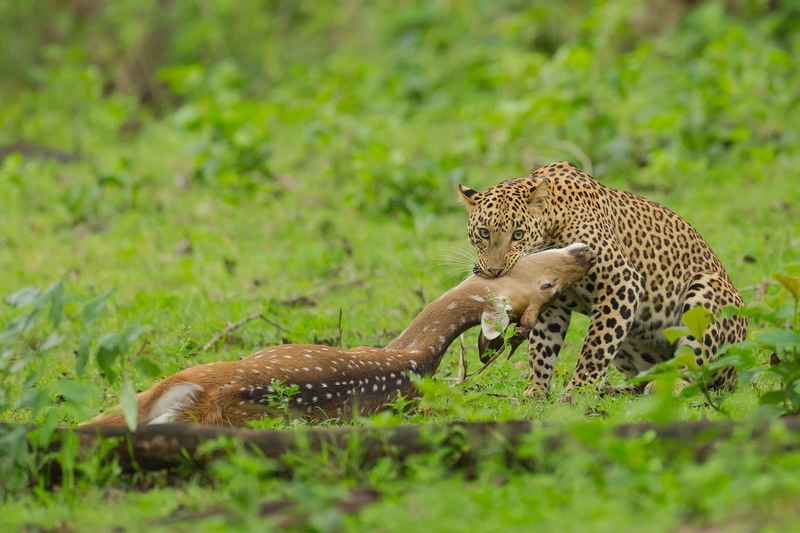 Initially the leopard tried dragging the deers utilizing the strength of his jaws and moving backwards, he realized it was taking longer than expected, as the deer was quite heavy. 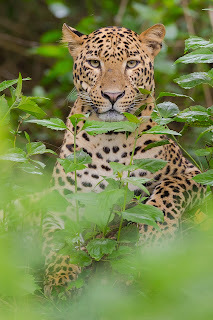 These cats avoid exposing their kill in the open for various reasons, like counter attack by other predators or scavengers hence will make all possible efforts to drag the prey into the bushes and later carry it high up on a tree. To ensure he moves quickly the typical strategy adopted by the leopard, he actually brings down the chital under his belly between the hind legs, yet holding it firmly with his jaws and walks fast and disappears into the bushes. (Refer image 4). 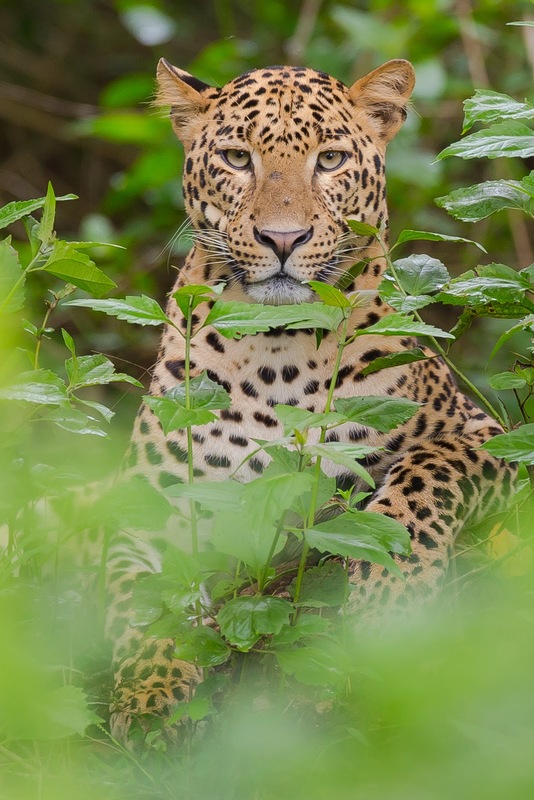 Leopards use a combination of stealth and patience when hunting, moving in as close as possible to the prey before attempting a charge or lying in wait for the prey to come within range. 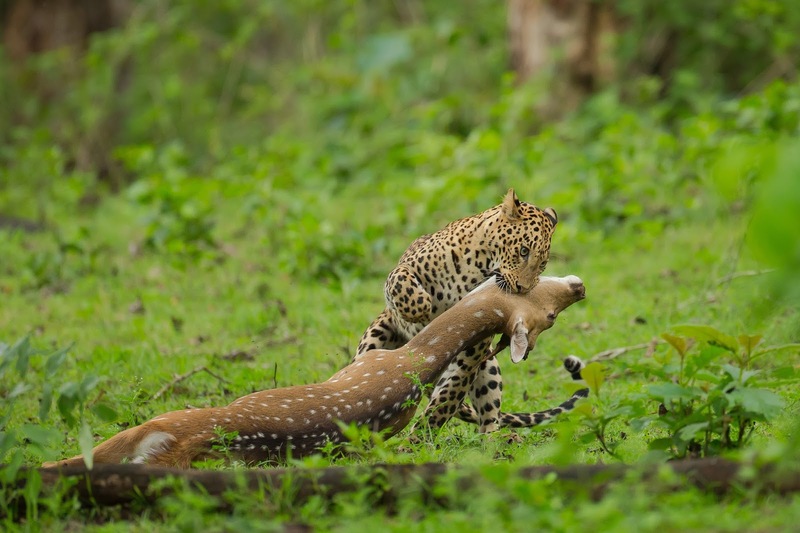 The power of the leopard enables it to pull the carcass onto a tree away from other predators such as tigers and wild dogs. A leopard can lift 2-3 times more than its own body weight into the branches.